Safe, Non-Contact Football Skills, Life Skills & Fun. 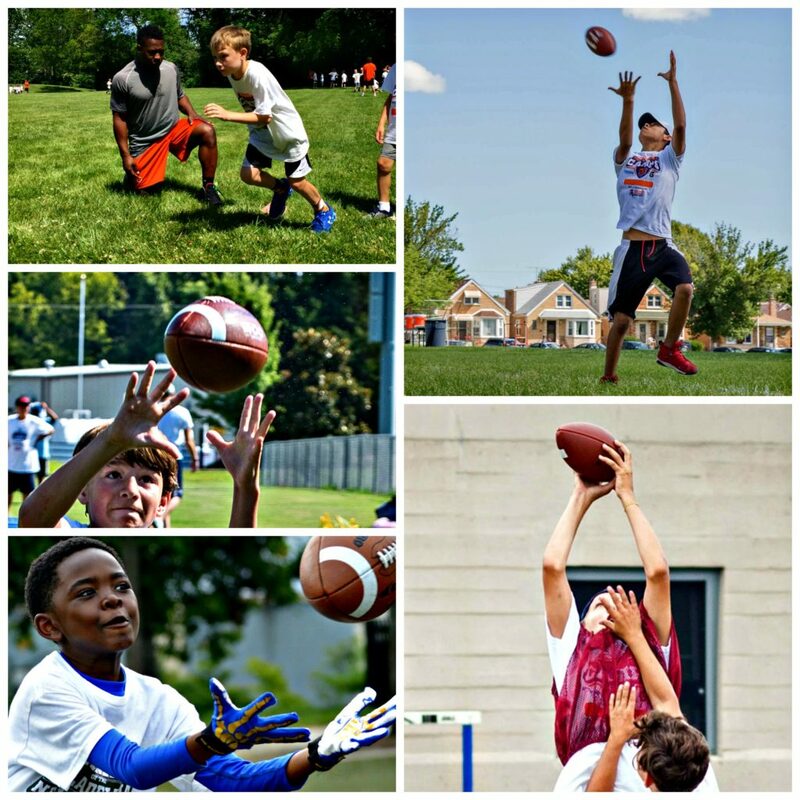 It’s football fit for kids ages 6-14. For price, facility street address and to purchase, click the camp. COACHES: Camps are led by professional, Powered by Pros, USA Football Certified coaches with High School, College or professional coaching backgrounds. See participating NFL Alumni Chicago Bears on tab below. Non-contact instruction for kids ages 6-14. NFL Alumni Chicago Bears Heroes supplement instruction. Small Space Games -2v2, to 4v4 platform. The Vital 5 Life Skill Lessons. USAFB’s curriculum for better, safer football. Big Football Friday includes Championship, Awards and Recognition. For 5-day, half-day camps, bring a snack and drink. We serve only water and/or sports drinks. Robert Sills, Leo Catholic High School, 13 yrs exp. Our coaches are supported by NFL Alumni Heroes from the Chicago Bears. These are men that earned their living wearing the NFL uniform. NFL Alumni Heroes are fathers and family men that understand the dynamics of communicating with young people. Heroes appear at various times throughout camp operations. Please see your confirmation email for your General Release and Waiver. All participants must submit a completed waiver in order to participate. A Release and Hold Harmless Agreement must be signed by a parent or guardian and submitted prior to the camp’s first day. The Release and Hold Harmless Agreement may be submitted electronically. REFUND POLICY: It’s a Strong Refund Policy. Here’s why. Pre-registration determines the number of staff hired and campers guaranteed to the facility. We financially commit to coaches, heroes and facilities for the week and do not turn back. That’s why we need you to be sure you are committed to us. Therefore, in cases of cancellation before or on April 15, 2019, you will be refunded less a $95 withdrawal fee. After April 15, 2019, in cases of cancellation, we will retain the full registration fee. Customers using payment plan codes agree that your payment is strictly a deposit and does not represent a fulfilled payment. All Camp Policies apply, including the refund policy. Payment plans may not be combined with other discount offers. Amendments to policies through promotions, such as “Early Birds” or “past loyal customers” will be honored as stated through the promotion.